This photographic portrait captures four very cute kids dressed in adorable clothing. Plaids, ruffles and bows abound. The image is crystal clear. The photographer is O. E. Flaten who at the time of the photograph, had studios in Moorehead and Halstad, Minnesota; as well as in Gardner, North Dakota. 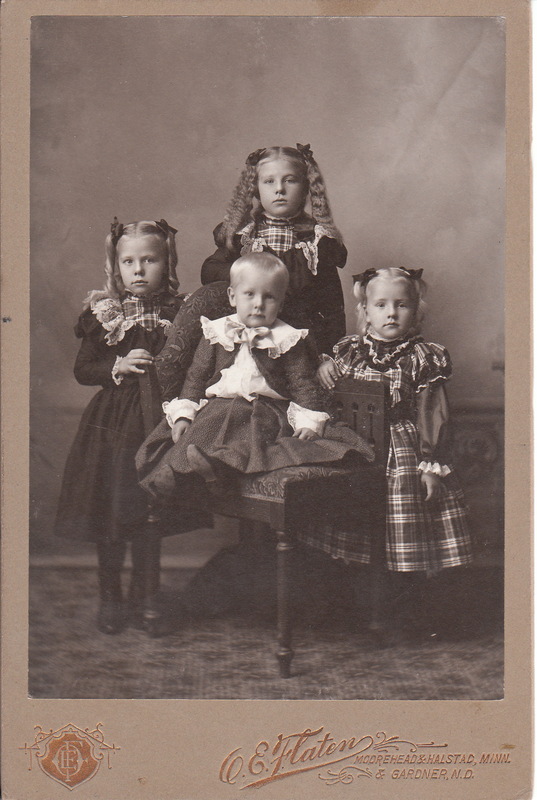 Research reveals that Ole E. Flaten (1854 or 1865- 1933) was born in Vanders, Norway and emigrated to the United States. He operated studios in Northfield, Moorehead, and Halstad, Minnesota. He worked as a photographer from the 1870’s through the 1920’s, retiring in 1930. Click on the category of “Photographer: Flaten” to see another photograph from his studio.